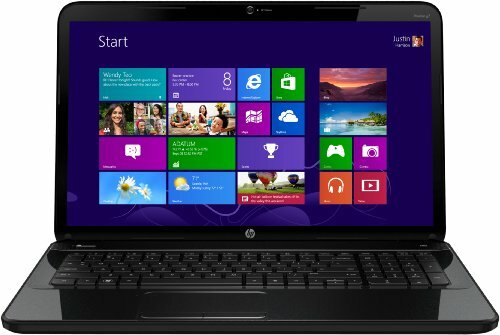 Below is our review of the HP Pavilion G7-2276SA, a 17.3 laptop, featuring 6GB RAM, 500GB hard drive and Windows 8. As with the majority of HP's laptop range, the G7-2276SA features the same black glossy finish, with rounded corners. This follows suit inside the notebook, giving it a uniform and slick feel - our testers for the most part like the overall design - however it does seem to show fingerprints in certain lights, and as such may require the odd wipe with a dry cloth after use. The first you notice about the Pavilion G7-2276SA is the size - with it's 17.3" screen, it's not particularly small or indeed light - weighing around the 3kg mark, and measuring 41.1cm by 26.7cm and with a depth of 3.7cm, it may not fit inside your rucksack, and is probably not ideal for regularly travelling with. The keyboard is very comfortable to use - with decent sized keys stretching across the width of the laptop. Also included is the handy addition of a numerical keypad to the right hand side of this notebook. The touch pad is located slightly to the left hand side of the notebook, to be in line with the centre of the letter keys - it offered good control over the laptop, and felt accurate and responsive during use. The Intel Core i3-2370M 2.4GHz Processor keeps applications running smoothly and fast, helped by the 6GB of RAM, as well as the speedy and spacious 500GB hard drive fitted. The hard drive in question operates at 5400rpm, as seems to be the norm for laptops in this price bracket. No complaints here. The backlit display, as mentioned, is a generous 17.3", and offers a pretty good picture at the default resolution of 1600 pixels by 900 pixels. The added benefits of working in front of a large screen meant that it felt less cramped than some of it's smaller screen rivals. The operating system, as you'd expect for newer notebooks, is handled by Windows 8, with ran well during the test period. In terms of connections, as a result of the reasonably large dimensions of this notebook HP have supplied you with quite a few options: a card reader, 2 x USB 3.0, 1 x USB 2.0, headphone out, microphone in, HDMI, Ethernet, DVD and VGA. So all in all what did we think? Essentially the G7-2276SA laptop is an example of function above form - it's slightly large, but very functional, and a pleasure to work on in a stationary environment. Pros: Decent screen, as well as an impressive specification for the price. Cons: Slightly too large for regular commuting - ideal for everything else though. If you're looking for a functional and practical 17.3" screen laptop, and don't need to travel with it regularly, then the HP Pavilion G7-2276SA is well worth a second look.